Webster’s Medical Dictionary defines tonicity as “Tonus; a state of normal tension of the tissues by virtue of which the parts are ready to function in response to a suitable stimulus.” This describes the state in which you want to leave the person’s body: Its systems are balanced and ready for whatever happens next. Achieving this state may involve flushing out stagnant emotional blocks, stale winds, and other decaying energies. Tonifying the organs begins to happen automatically right after they have been detoxified. The energy spent by the organs in storing and processing the toxicity is now available for beneficial use by the organs. In Chi Nei Tsang, points on the energy channels of those organs are also stimulated. Tonification is very soothing, and you may easily cause the person to fall asleep. 1. One hand holds the lung point, Lung-1, on the chest, while the other hand is massaging the lung area marked on the Chi Nei Tsang chart. Massage the point on both sides, starting on the left. 2. While you are pressing the points, the person being massaged should inhale through your hands. When exhaling, he or she should softly make the Lungs’ Sound (Ssssssss) and visualize the color white. Both of you may feel sadness coming out, or a heavy sigh. After the lungs’ energy has been cleared of negative influences, try to sense whether it is strong, healthy, cool, and dry. Be aware of your particular methods of sensing. You may be very good at noticing emotional response, or better at determining subtle changes in organ temperatures. You might have your own method or strong intuitive feelings. Sometimes the change in energy is dramatic, but at times it can be subtle. 3. If more energy is required, stimulate Large Intestine-4 (LI-4) in the web of the thumb and forefinger. 4. Monitor the lungs’ pulse on the wrist. All the organs can be tonified similarly, but do not fear that a lot of unpredictable emotional energy is going to come your way. Usually one emotion will release, and this will help to relax the tension in the neighboring organs according to the Laws of the Five Phases of Energy. You can work together to forestall or lessen the impact of the emotional release. If your client loses a positive state of mind, teach him or her how to recapture it, or the negative emotion that is released could be transferred to you. If you can determine what negative emotions are predominant, both of you should focus on the opposite positive emotion as you begin the emotional release. Both of you should do the Inner Smile as well. When a person is impatient, anxious, hasty, and/or feels hatred, the heart area will be congested, tight, painful, and blocked. Breathing can be difficult. To release the tension and tightness and increase self-esteem and confidence, massage the sternum close to the heart. 1. Use the one finger technique, starting from the top of the sternum working down in small spirals to the tip of the sternum. If you find painful parts, work slowly and gently, but spend time on it. Look at the person’s face. If it shows pain, just hold the point at the tip of the sternum and HT-7 for a while. Massage the tip of the sternum gently and carefully since it is soft. Work thoroughly as you massage from the top of the sternum down to its tip. 2. Massage in between the ribs and the places at which they are joined to the sternum. Work specifically in the area below the collarbone. Here you will find painful spots on most people. 3. If there is a lot of pain, ask the student to make the Heart’s Sound (Hawwwwww) and visualize the color red as he/she is massaged. This is an exercise to reduce stress and recharge Navel Center Chi. 1. Place the right thumb on the right hipbone and spread the fingers over the kidney. The middle finger should be on the sacrum with the other fingers lying along the spine. If you have small hands and are working on someone very big, just be sure to cover the kidney with your hand. Use the hand to send energy to the kidney. A strong kidney can nourish the whole body. It is especially beneficial for the lower abdomen, since it can release lower back pain and tension. 2. Place the left palm above the navel, just below the sternum. Press down with the left palm in a counterclockwise circular motion. Press up with the right hand. Gradually, move the left palm lower toward the navel. 3. Practice nine, eighteen, or 36 times. Rest and concentrate on the navel for a while. 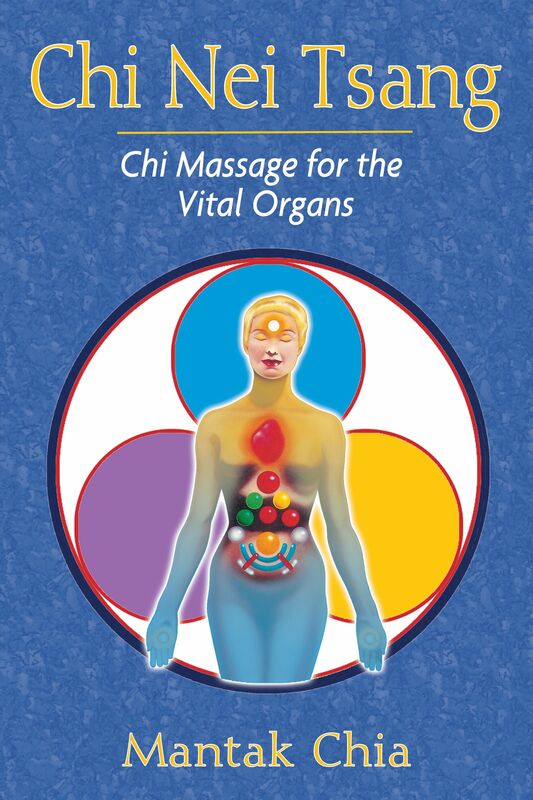 Feel the Chi energy start to move in the navel and collect at the Navel Center. 4. Switch hands and do the same on the left side. Place your right hand on the navel and your left hand on the hip and kidney. Use the right heel, palm, and fingers to massage the Chi of the navel in clockwise movements gradually descending from the sternum area toward the navel. You can do this nine, eighteen, or thirty-six times. ". . . an excellent guide with clear explanations." "The system works to address conditions and symptoms modern medicine is often unable to cure because a physical source for the problems cannot easily be found."